It can be difficult and a real challenge to find time in our week, let alone our day, to do all the things we have to do. Cooking. Cleaning: dishes, bathrooms, floors, dusting, and vacuuming. Laundry. Working. Playing with our children: watching, washing, feeding, and reading. Bills. Shopping. Doctor appointments. It’s never ending. What am I leaving out? Okay, we get it. If you’re struggling– there is relief. Time Management. Ahhh yes, that friendly skill our teachers and professors harassed us about! First: you must get a calendar. It needs to be something you will actually use. So, if you are always at your computer and prefer an online/computerized one- go for it. Or, if you are like me you may need something hands on. Second: A system. You need a system that works. 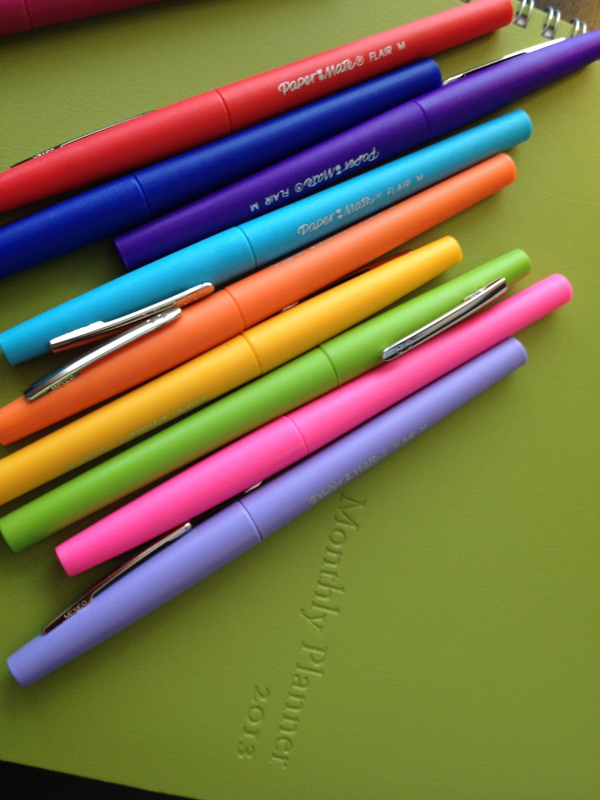 For me- I color code. But, you don’t have to. Maybe use blue for work, black for chores, and another color for events..etc. 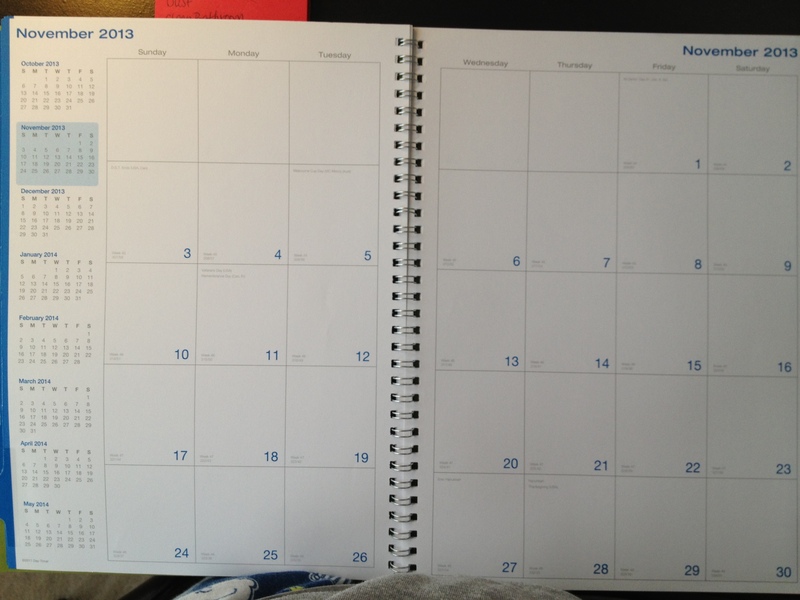 No matter what though, you should write down what it is your doing in a similar spot, and on a particular day. 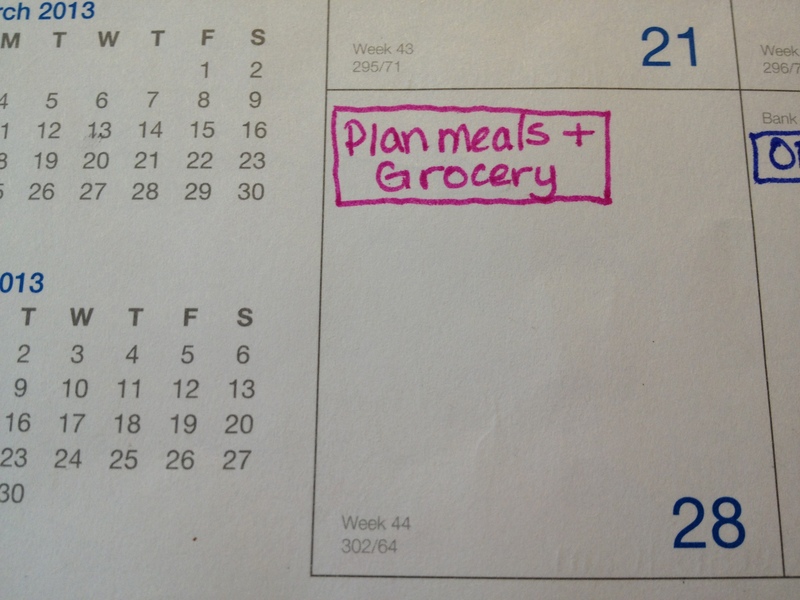 For example- here I have located at the top of each sunday, “planning meals & grocery shopping.” You will want to consider prioritizing certain things (you could even color code by priority). Third: Choose days for chores. Tuesdays are my chore day. I work in the evenings, so I know I have Mckinley’s nap time to get things done during the day. Knowing yourself and your schedule is really half the battle. By choosing a chore day, the idea is that you’re more likely to keep up with it each week, which cuts down on time, and reduces stress. Choose days for relaxation. Chose when you will start to write that paper, when you will grocery shop, and when you’ll clean out that closet. *Note: If you are a student -insert the due dates of your assignments into your calendar – Then go back and plan ahead when you will actually work on the assignments. This will help keep you ahead of the game and leave you not procrastinating (even if you do your “best work” that way). *The trick to time management is writing everything down. There is no way I have ever or will ever 100% follow my calendar to a tee. Do not put that pressure on yourself. It is however, one of the best strategies to getting organized, staying on top of things, easing stress, and managing your time effectively and efficiently. Forth: Crossing out. Have a method for keeping track of what you do and don’t do. I like to cross things out when I have done them, because I get a feeling of accomplishment. If you are a list person- you know the feeling. Notice though, I have highlighted and circled “bathroom” because it was a chore I did not get to. In doing this, it allows you to not forget that event/chore or whatever it may be, simply because the day has passed. I’m a teacher (at 2 different schools), a coach’s wife and, of course, a mama. Organization is so essential. I have a checklist that I have created that divides my world into categories: home, health, one for each school, the blog and family events. It helps me to separate my worlds yet keep them all together. I only have 5 lines per section. Once, I get 5 major things in that category, I prioritize and see what I can “put off” until tomorrow. This helps me to create balance. Mamacravings, what a fantastic system! Prioritizing Is an important step in time management. Thank you for sharing and stopping by!! I’m in desperate need for a system, I am a list person and feel so much better when I’ve got things written down. Great post, I feel inspired to start managing my time better. elskenewman,(I’m a list freak!) I’m glad my posting inspired you! Keep me posted! I will, I just have to figure out what will work for me and sort out a planner. Thanks for the post! Yes, for some individuals organization can be “OCD” like- while some need a laid back approach. This is why when attempting to implement time management is it critical to understand not only your schedule, but personality. Either way, we must find a “system” that works! I keep a monthly calendar page on the fridge so the whole family can see what is in store for the day, it is also an easy place to add notes from a phone call, or conversation. That’s a great idea! Also a great visual aid! Pingback: Do You Always Wait Until The Last Minute?